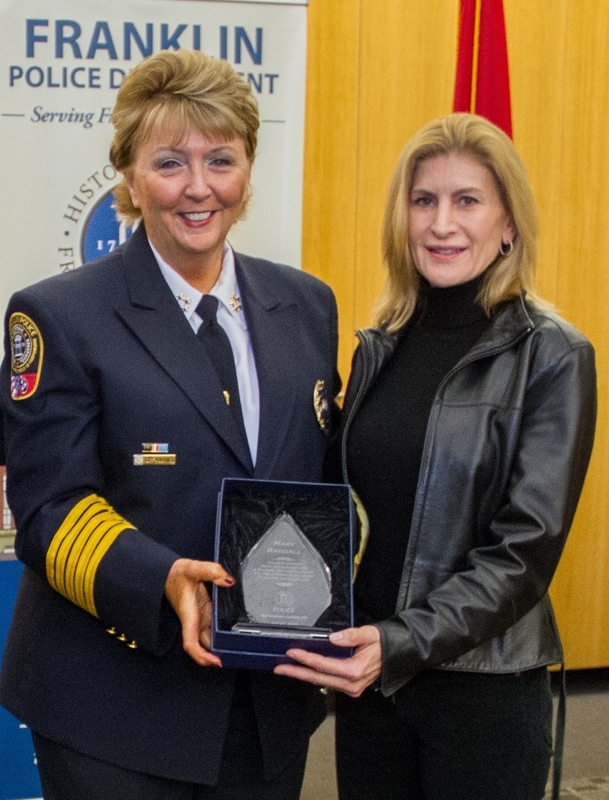 Citizens play an important role in helping to safeguard our community. 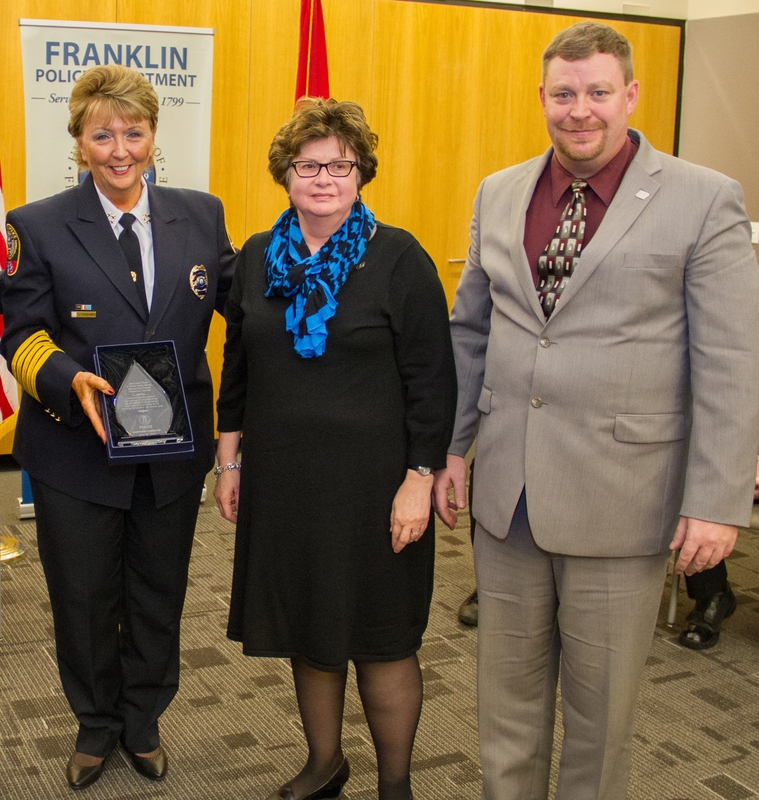 On Tuesday, at a formal ceremony at Police Headquarters, Franklin Police Chief Deborah Faulkner, City Administrator Eric Stuckey, and Mayor Ken Moore honored five citizens for their 2015 actions that left a lasting impression. On a frigid February morning, in the midst of a powerful snow and ice storm – through the lens of his camera, Keith Sheldon was capturing the beauty a winter storm had unexpectedly brought. In the midst of taking photographs, Mr. Sheldon saw something that changed his life, and the life of a 74-year old woman with memory issues – forever. The woman, reported missing by her family two days prior, became confused during the storm. When Mr. Sheldon spotted her, she lay, literally, frozen to the ground in a remote area off of Franklin Road. The woman miraculously opened her eyes when Mr. Sheldon knelt down to check on her. Emergency responders were able to separate the woman from the ground she had frozen to, and provide life-saving care. On June 18, employees inside of a Fifth Third Bank saw everything turn from business as usual to anything but ordinary, as danger lurked just outside as a bank robber lay in wait for his opportunity. Employees inside actually saw a man wearing a heavy coat on a hot summer day, carrying a backpack, pulling a bandanna over his face on his way to the door. Bank employees feverishly worked together to alert one another of the approaching danger, and actually locked the suspect out as he reached for the handle. Employees provided incredible detail to 911 dispatchers who relayed critical information to area officers who quickly spotted & captured the suspect. 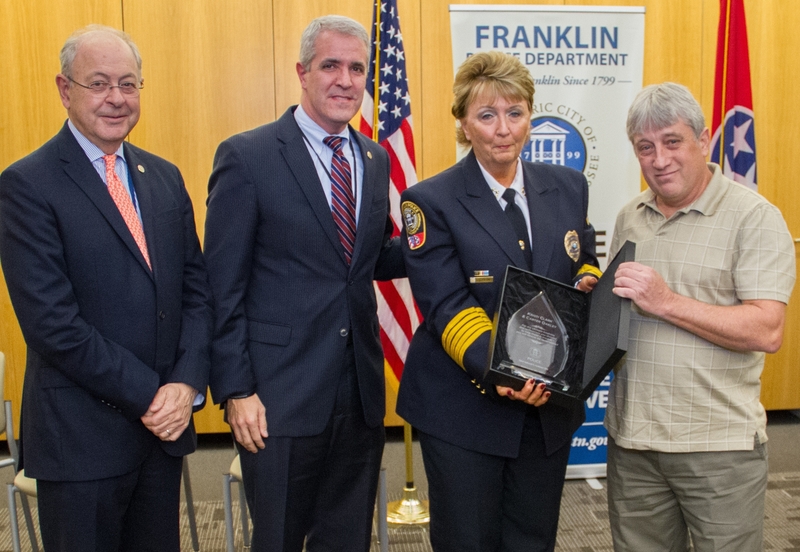 Employees Michael Logue and Sharon Kirby accepted the award on behalf of Fifth Third Bank. On July 21, Franklin Police issued a Silver Alert for a missing 80-year-old woman with significant memory issues. In a very out-of-character move, the woman got behind the wheel of the car she was waiting in, while her driver and caretaker had gone into the mall – only for a moment. Destined for nowhere, this sweet lady met another sweet lady – Mrs. Mary Randall, who was simply checking on horses at an Old Hillsboro Road farm. Those horses, and that farm brought these ladies together, and presented Mrs. Randall the opportunity to help reunite an obviously lost and confused woman with her worried family. On February 16, black ice covered Middle Tennessee Roadways. Kristi Clark and her 10-year-old son, Carter Oakley, were making their way home. While traveling down I-65 between Murfreesboro Road and Peytonsville Road, they came upon an overturned SUV laying in the road with injured victims, scared and alone, who needed help. Kristi, a nurse with a predisposition to care for others, and Carter, following the kind and caring example set by his mom, got out to provide that help. In an unlikely moment of tragedy, they lost their lives when two oncoming semis slid out of control and struck them that February night. They died heroes, helping others. 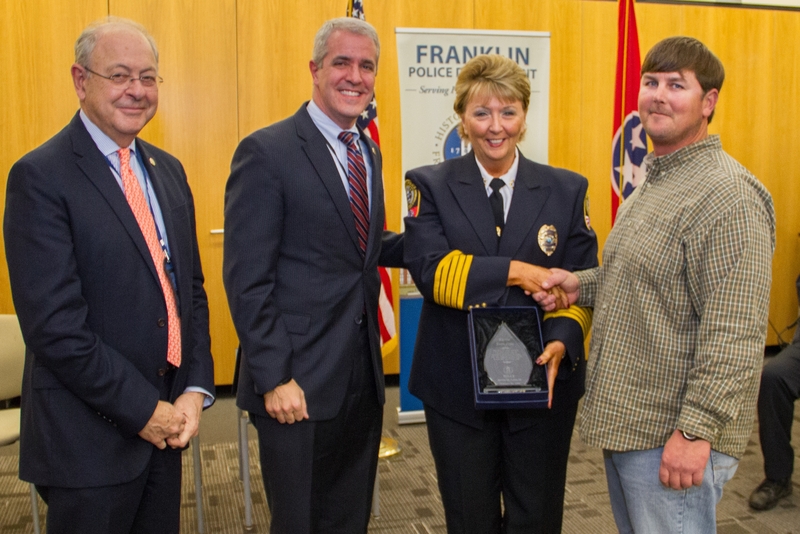 Kristi’s dad, and Carter’s granddad, Mr. Brad Lewis, accepted the posthumous award on their behalf. 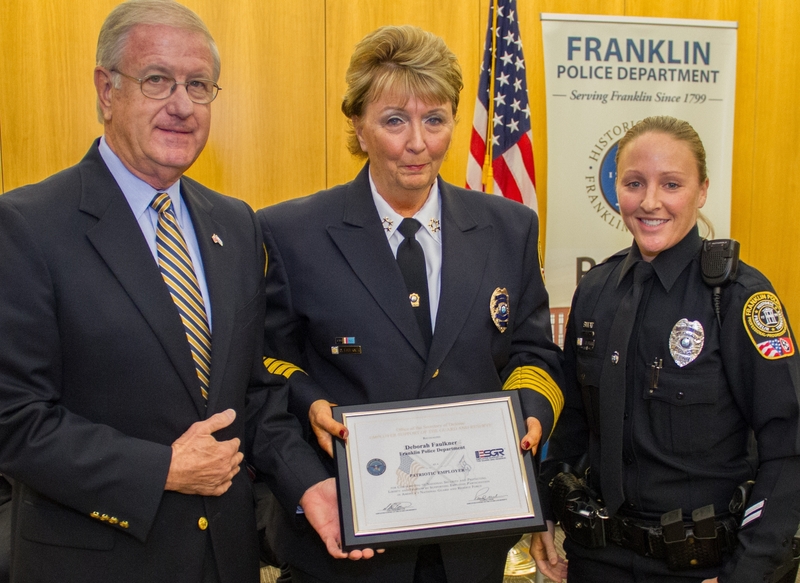 The Office of the Secretary of Defense surprised Chief Deborah Faulkner at the conclusion of the ceremony, honoring her and the Franklin Police Department for their extreme support of FPD officers away on military deployments, citing the Department’s contribution to national security, and protecting life and freedom.